Ruby Ditcher, who started Tavistock Parish Church’s annual Christmas Bazaar 48 years ago, is still playing an active part – helping man the jewellery and accessories stall at the event in the town hall on Saturday November 17. The day proved a huge success, swelling the Bazaar Fund (which includes Friendly Fridays coffee mornings) by £5,730, towards church funds. Church candle wax used for cup and saucer novelties were among an array of items the Craft Group busily recycled for the bazaar. 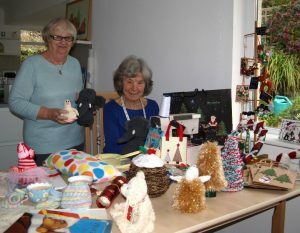 The group’s wares vary from Christmas ‘pressi’ bags, soft toys, wreaths and hangings, to gift tags, recycled cards and sideboard decorations. The knitters regularly run a stall at our Friendly Fridays coffee mornings and so far this year have raised £635 for church funds. Janet, a chorister, and Ruth also sell cards they make from recycled ones after Sunday morning services. Janet believes the craft group was started more than 20 years ago by the wife of the then vicar, John Rawlings, making cushions for the pews. Ruth said they were grateful to people who kept the members going with wool, cards and other materials.